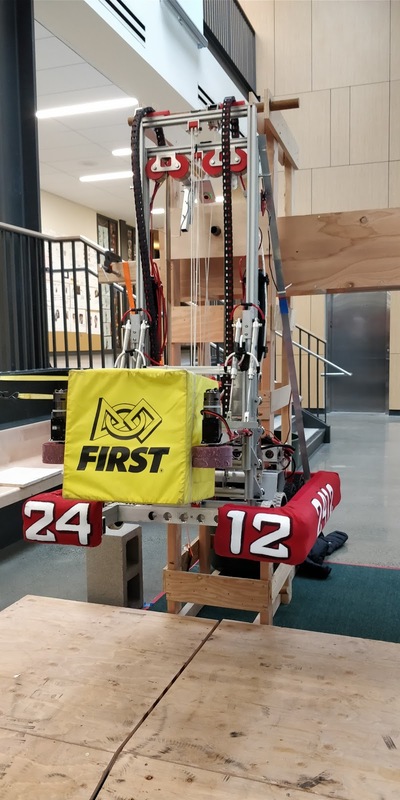 After many weeks of blood, sweat, and possibly tears, FRC Team #2412 is proud to present our 11th creation: Griffin. Griffin can place (and shoot!) cubes in the switch, scale, and vault, as well as climb (pictured above). 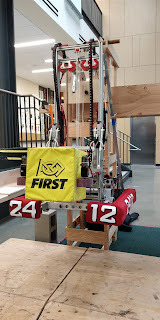 Today was the last day we had to work on the robot before bag and tag. Like yesterday, we focused on drive practice and autonomous. We reached a maximum of 6 cubes in the scale (but no climb, just parking on the platform). We also reduced the robot's weight (aka drilling random holes and removing the metal shavings). The worth of our new electronics board was proven many times, as we ended up removing it quite often.